Is there a difference between Strings and Long Strings? hold the same amount of bytes or characters. The max size of a (Long) String is dependent on the max memory size of the system. There is in fact no real fixed limitation. When data is passed to a database (INSERT, UPDATE) or fetched from a database (SELECT) there IS a difference in String and Long String. TD needs to know if the data needs to be handled differently when the database column will hold larger amounts of bytes/characters. So the TD database routers will handle the data in bind variables of SQL statements differently ! Basic rule is that columns defined with more than 254 characters (VARCHARs, BLOBS, LONG etc) will need Long String datatype. The String and Long String datatypes are interchangeable. You can assign a String variable with a Long String and visa-versa. you can use the String datatype for all data manipulations.
! sResult has the value "ABC  "
When the source string is greater than the requested size, the source string will be truncated. This means the result string will always be the same size as the nResultStringSize parameter. If you want to place prefix characters to a string use this function.
! sResult has the value "XXABC"
Set sValue = "It seems all is OK"
Set sValue = "An error"
A nice way to define a newline is to create a string constant in your source. When entering this constant, press CTRL-ENTER after the first apostrophe. Here a few samples using this constant. Set sText = "This is the first line" || NEWLINE || "This is the second line" || NEWLINE || "This is the third line"
A newline in a string is represented as two characters, the CR (Carriage Return) followed by LF (Line Feed). In TD, string comparison like this is case-sensitive. So in the example, the strings are not equal. An easy and faster way is to use lstrcmpi from kernel32. 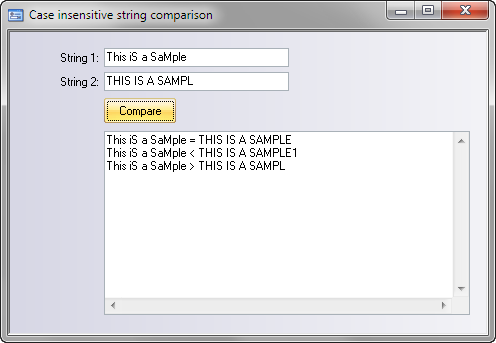 This function compares strings, the comparison is not case-sensitive. One nice side effect, this is faster compared to the TD implementation. The performance will even increase when the strings to compare are larger. This page was last modified on 29 October 2013, at 12:07.